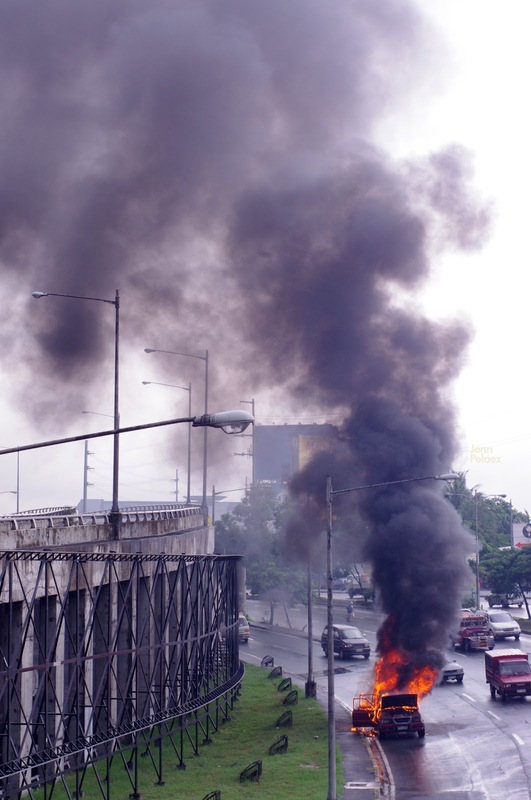 Red pickup truck caught on fire along C5 Market-Market Southbound. July 29, 2012. More or less 2 hours after this happened, I'm still waiting for news on how this could've happened. Also, I'm waiting to find out what happened to the passengers. I hope they're not harmed. Here is the text of the same photo I posted on Tumblr. I only saw and heard the last of the exploding-like sounds but I stood there for about 5 minutes wondering where the passengers are and deciding if I should grab the camera in my bag. I, along with all the bystanders looking out from the C5 Market-Market overpass, were waiting for the fire trucks to arrive but none came. After I took photos from my camera, it started raining. Instead of the people fleeing the scene, we actually all cheered. The rain did what firemen should be doing, extinguish the flames as soon as possible. I found cover from the rain and decided to wait until the rain subsides or until the fire trucks arrive, whichever came first. It took roughly 10 minutes of waiting until the firetrucks eventually came, because of the far u-turn slots perhaps? Still waiting to hear more details from the news.